BALTIMORE, MD--(Marketwire - March 8, 2011) - Calling all lacrosse players and fans, the Face-Off Classic is back, and you can have front row seats when you stay at M&T stadium hotels. Come and watch all the top college lacrosse teams battle it out for a chance at the championship at M&T Bank Stadium. If you have already marked off the date for the Face-Off Classic on your calendar, or you are thinking about attending, you still have enough time to plan an exciting trip to watch the games with Baltimore hotels near the convention center. These Baltimore convention center hotels are guaranteed to allow lacrosse fans like you to enjoy great accommodations in a relaxed setting, which means there will be no trouble getting to the games. With hotels near Baltimore Convention Center like the Fairfield Inn & Suites Baltimore Downtown/Inner Harbor Hotel, your journey to the Face-Off Classic is even easier. This hotel is Baltimore's lacrosse headquarters hotel as it is the official hotel for Inside Lacrosse. The hotel is also the official partner of the Chesapeake Bayhawks and their only ticket sales location in Baltimore. The Fairfield Inn & Suites Baltimore Downtown/Inner Harbor Hotel is the partner of some local lacrosse teams, both professional and college, and is only minutes away from M&T Bank Stadium. So if you are one of the fans who are eagerly anticipating the start of the 2011 season you should take advantage of hotels near M&T bank stadium. Set for Saturday, March 12 at the M&T Bank Stadium, the Face-Off Classic will create a unique game-day experience for all attending this event. 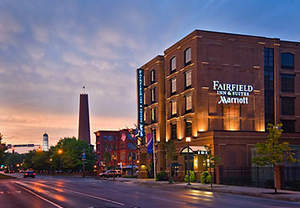 Guests who stay at the Fairfield Inn & Suites Baltimore Downtown/Inner Harbor Hotel will be able to enjoy spacious rooms and great rates on their tickets since the hotel has a preferred rate agreement with Inside Lacrosse. The Fairfield Inn & Suites Baltimore Downtown/Inner Harbor Hotel is conveniently located just minutes from M&T Bank Stadium and many of Baltimore's popular dining, shopping and entertainment venues. This hotel is an excellent choice for both leisure and business travelers who want to enjoy an exceptional getaway or extended stays in Baltimore. Located in the heart of Baltimore's Inner Harbor Area, we are close to so much, you will have trouble deciding what to do first.